A lot of Captain America: Civil War involved laying the groundwork for the Black Panther movie, and during its Comic-Con panel today, Marvel unsurprisingly revealed that Ryan Coogler’s Black Panther will actually take place just after the events of Civil War—meaning T’Challa’s father has just been killed and Bucky Barnes has just been released into his custody and re-frozen until people can figure out how to stop him from turning into a brainwashed murder machine again. Other than that, Marvel offered some character details on Black Panther’s supporting cast, but the biggest part of the panel was some secret footage that apparently won’t be released online (a rarity at this year’s Comic-Con). Luckily, Marvel can’t stop anyone from describing what it entailed. 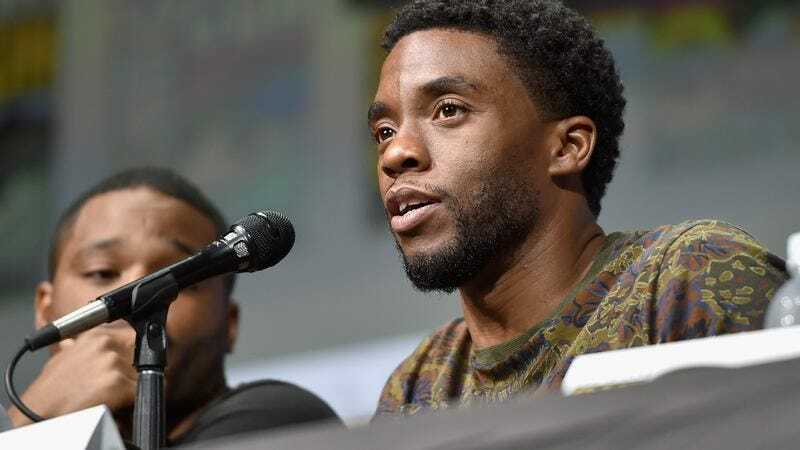 The clip reportedly opened with Chadwick Boseman’s T’Challa arriving at a casino of some sort with Lupita Nyong’o‘s Nakia, intent on stopping a meeting between Andy Serkis’ Klaw (now with a robotic arm after Ultron cut off his old one) and Martin Freeman’s Everett Ross. Before the two of them can do any bad stuff, though, T’Challa jumps in and starts fighting (some of which was seen in the trailer), with Klaw’s arm transforming into a weapon and the Black Panther suit forming around T’Challa. We’re not sure what that looked like exactly, but it was probably awesome enough to put Iron Man and his increasingly involved suit-up tricks to shame. The clip then jumped to a car chase set to Kendrick Lamar’s “Loyalty,” and later the Black Panther suit formed over T’Challa again but now with slightly different gold accents.